You must be a member of the Antwerp Movie Nights Group to attend this activity. Would you like to join this group? Join us for the first movie night of the year to watch this classic British biographical drama. 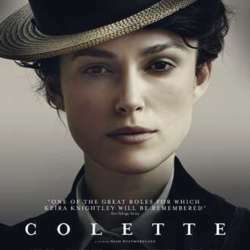 At the dawn of the 20th century, Colette tells the story of a woman whose inner voice as a writer has long been denied. She is willing to take extraordinary measures to promote the emergence of her inner voice as a new writer. Sidonie-Gabrielle Colette, is a young woman from a country village, and marries a charismatic and dominant Parisian, the eldest of fourteen. He is known only as "Willy". Under his auspices, she is initiated into the bohemian life-style of Paris where her creative appetites are triggered. Ready to capitalize on her talent, Willy convinces his wife to write novels, which he suggests should be released under his name as the purported author. The phenomenal success of the series of novels titled "Claudine" makes Willy a well-known writer and "Colette and Willy" the "first couple" among contemporary celebrities. For the movie fans who want to have a nice and quick dinner before the movie we will meet at the Protected content at 19h00. If you are interested in this dinner please let me know so I can reserve a table for all of us.